The Utah-approved Medicaid expansion initiative was replaced on Monday by a program that is more restrictive, initially more costly and depends on a series of uncertain federal concessions. Lawmakers say the bill is more economically sound in the long term. Senators voted 22-7 to adopt the SB96 version of the House of Representatives, which launches a partial expansion of Medicaid on April 1 and would go back to full expansion only in the event that federal administrators reject multiple exemption requests of the Affordable Care Act. "We are doing the long-term responsibility," said Sen. Allen Christensen, R-North Ogden, sponsor of the bill, "that we are bound by the [state] Constitution to do. " On Monday afternoon, the governor of Utah, Gary Herbert, had enacted the bill. In a prepared statement, Herbert said the bill balances compassion and frugality. "It provides quality coverage to the same population covered by Proposition 3 in a meaningful, humane and sustainable way," said Herbert. "Now is the time to put aside the differences and move forward to enroll the most needy in Medicaid and in federal health care exchanges. While SB96 allows the same population of Utah residents to access subsidized health care as it would under Proposition 3, it does not provide coverage for the same number of people. Low-income citizens who earn up to 138 percent of the federal poverty level could have enrolled in Medicaid under the initiative, while SB96 limits enrollment to 100 percent of poverty. The rest of the expanding population is left in SB96 to purchase subsidized health insurance plans in the individual market of the Affordable Care Act, accompanied by premiums, copays, deductibles and other out-of-pocket costs for care. The bill was opposed by the six Senate Democrats and a Republican, Woods Cross Sen. Todd Weiler, matching the Senate votes in previous versions of the Medicaid expansion replacement bill. "We still are not giving the people of Utah what they voted for," said Senator Luz Escamilla, D-Salt Lake City. "We could do this the other way." But some Republicans who oppose Medicaid expansion see the bill as the lesser of two evils. On Monday in the Senate, Lehi's Republican Senator Jacob Anderegg repeatedly said he "hates" SB96 and said that supporters of Medicaid expansion are really motivated by the desire to establish universal public health care. And universal medical care, Anderegg said, would be "the worst thing that could happen to us." "Hate [SB96]but I will vote in favor because I have no other option, "said Anderegg." And yet, in the same way, I fully recognize and concede that this will, in the spirit of the law, will fulfill most of what that Proposition 3 meant for people. " Monday's vote was criticized as "insulting" by the United Party of Utah, a centrist political organization that aims to appeal to the disgruntled voters of the two main parties. 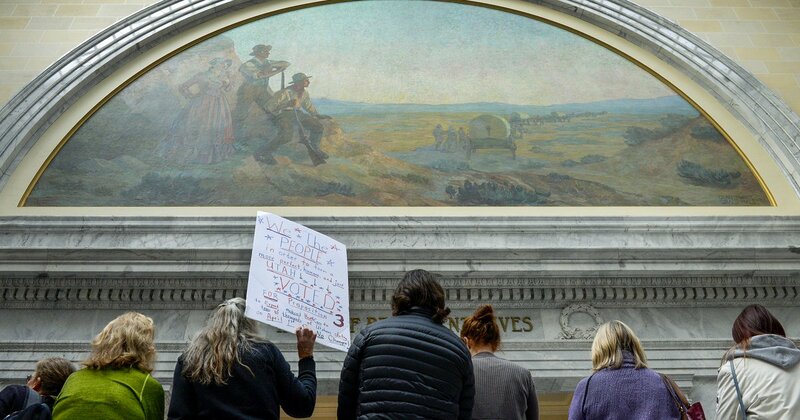 In a statement, Utah United Party President Richard Davis said lawmakers had ignored research that showed the economic value of a healthy population and that their action on SB96 would erode voter confidence. "If someone asks why so many people become cynical about politics," Davis said, "all they have to do is look at what the Legislature did with Proposition 3." Utah voters approved three initiatives in November, related to medical marijuana, Medicaid and the redistricting of independent districts. With Monday's vote, legislators significantly modified two of those initiatives, and the third, Proposition 4, will likely face legal challenges, legislative amendments or both. When asked when lawmakers were going to turn their attention to Proposition 4 and redistricting, Senate President Stuart Adams, R-Layton, said that it is already a matter of discussion, but that there is time before the next drawing round of electoral maps, which will take place after the 2020 census. "There are questions about Proposition 4 and constitutionality," Adams said. It is to be hoped, he added, that any law, whether approved through legislation or a voting initiative, will undergo adjustments, potentially in perpetuity. "We will work with cannabis or marijuana for the rest of our lives," Adams said. "Once we have a statute, a referendum or a bill in front of us, we will continue working on it, probably forever."